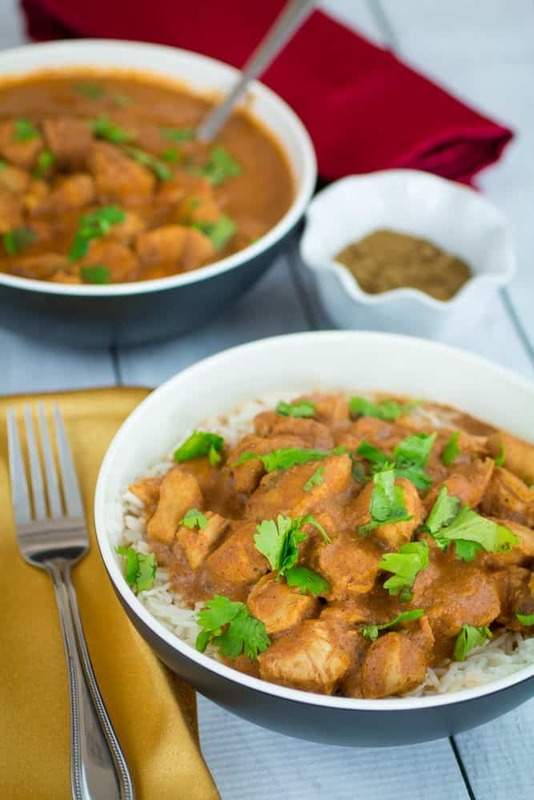 This is an easy Slow Cooker Chicken Tikka Masala recipe. Rich and savory with a creamy tomato base and (an optional) kick of spice, this dish is sure to please your whole family. Set the slow cooker and forget about it, you won’t believe how easy this is to make! It’s also packed with protein and good-for-you veggies, so you can feel great about enjoying this delicious dish. I love Indian food. Probably more than any sane person should, really. You see, I am very fortunate to live across the street from one of the best (in my opinion) Indian restaurants in the tri-state area. Oh, yes. I’ve tried them all. …Or at least most of them. And while going out on the town for a traditional Indian meal is second only to what I imagine heaven would be like, sometimes there just isn’t enough time (or energy) in the day to make it out the door. 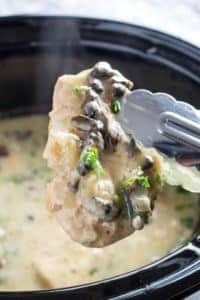 Even though I may or may not be on a first-name basis at my favorite restaurant, there’s something to be said for being able to create your favorite recipe in the comfort of your own home. And that’s what I’m bringing you today. That’s where slow cooker chicken tikka masala comes in handy! I’ve made it my mission for over the next few months to get some of my favorite Indian recipes up on this blog. My goal is fast, easy and with wholesome and easy-to-find ingredients. Sound good? I think so! If you have a request, let me know in the comments! So, back to reality for a second, we should take a moment to recognize the cocktail of spices that goes into a dish like this. First, get the notion of “over spicing” food out of your head. Is it gone yet? It is? Ok, good. Because dishes like this really prove just how spices can take an ordinary dish from something pretty good, to something absolutely magical. And that’s where I’m coming from with the slow cooker chicken tikka masala. It’s a spicy, savory tomato sauce wrapped around tender chicken pieces, with the satisfying aroma of spices wafting through your kitchen. Then you get to top it with freshly chopped herbs and lay it over a fluffy bowl of nutty basmati rice. Come on. Even I’ll admit that’s pretty irresistible. You can even throw some vegetables in here, if you really want to. I’d try peas, or spinach. I highly recommend serving this with basmati rice, cilantro and a big ole’ scoop of yogurt on top. That’s just how I like it, I’m sure you’ll find your own way of enjoying your slow cooker chicken tikka masala. Basmati rice has an aromatic and nutty flavor, and really brings a great flavor to this dish. You can sub coconut milk for the heavy cream, and it will come out just as delicious. Maybe even a little sweeter than the recipe below. Keep in mind that the addition of cayenne pepper can add a big kick to this dish, so use sparingly. Unless you like your food with plenty of heat (in which case, I love you). You, my spicy pioneer, can add an additional tsp of cayenne. I made mine with 2 tsp, but we love spicy in this household. 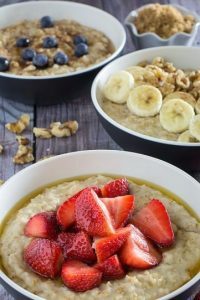 I also recommend curling up with a big bowl of this dish on the couch with your favorite movie and a big comfy blanket. I’m not afraid to admit it, I’m really getting my comfort food on with this dish. 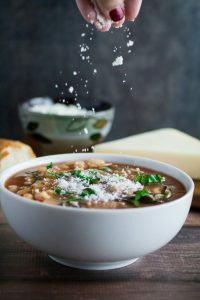 You just have that full and taken care of feeling while you’re eating it, and when you’re done all you have to clean up is one slow cooker dish. Big flavors going on here, plus minimal cleanup, is the key to a happy foodie life. For real. I don’t know about you, but that’s pretty much all I need in my life right now. I really love how authentic this dish tastes, without the authentic work involved in making it. In other words, my slow cooker is my best friend, and anything that can be made (and taste great!) in it should be. But I feel that it’s worth mentioning that Slow Cooker Chicken Tikka Masala isn’t exactly traditional Indian cuisine. I believe it really gained its popularity in the UK. In fact, there are some rumors that this dish was actually developed by a Pakistani chef living in the UK, and can even be considered a British national dish. Others claim it came from the British-Bangladeshi community. Either way, I’d like to say a personal Thank You to whoever came up with this, because it is Ah-Mazing. Sometimes, I like to make a few different dishes, especially if your family likes variety. Or, you know, just eats a lot. So here’s a few more of my favorites rounded up just for you! This should give you a good amount of options. You could even try one a night, to see what type of dish you really like. You know, after slow cooker chicken tikka masala, that is. Easy Chicken Biryani from Noshtastic. It’s colorful and flavorful! Paneer Stuffed Croquettes from Ruchi’s Kitchen. I would probably eat a whole plate of these myself. Coconut Rice from Divya’s Tasty Recipes. You definitely need rice to soak up all the sauce from these dishes! Slow Cooker Spicy Madras Vegetable Curry with Coconut Milk from Boulder Locavore. North Indian Chana Masala from AG Nutrition Wellness. This is a garbanzo bean recipe that looks too good to pass up! So, there you have it. A full-on Indian (and, um, UK) feast for when you’re in the mood to get into the kitchen a cook! 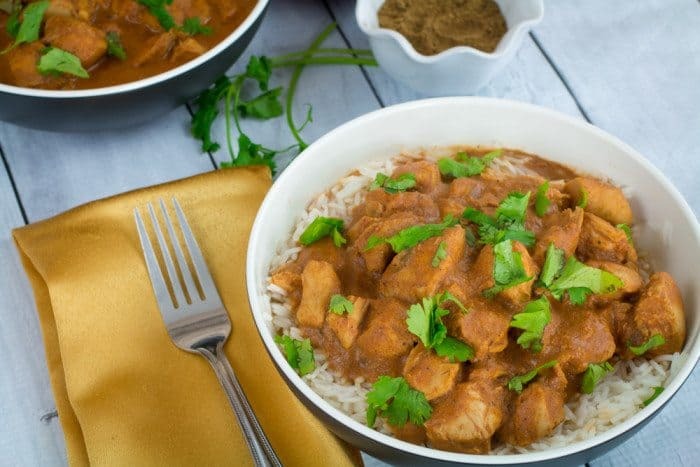 I don’t know about you, but after making this post, I’m about ready to dive into a big bowl of this slow cooker chicken tikka masala right here. In fact, I’m going to use the big spoon tonight. Because when it comes to food this good, only a big heaping serving will do. 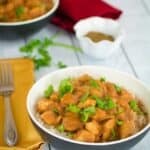 This is an easy Slow Cooker Chicken Tikka Masala recipe. Rich and savory with a creamy tomato base and (an optional) kick of spice, this dish is sure to please your whole family. 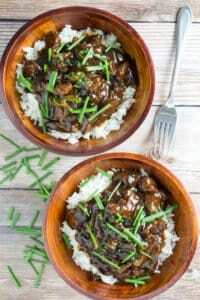 Set the slow cooker and forget about it, you won't believe how easy this is to make! It's also packed with protein and good-for-you veggies, so you can feel great about enjoying this delicious dish. In a large mixing bowl stir together yogurt, tomato puree, lemon juice, tomato paste, olive oil, garam masala, ground ginger, cumin, paprika, garlic powder, cinnamon, sugar, salt, black pepper, and cayenne pepper (optional). Add onions, bell pepper and bay leaves and mix in until well combined. Pour into slow cooker, then add chicken, stirring until chicken is well-coated with sauce. Add butter on top of chicken mixture (it will melt and mix in as it cooks). Cover slow cooker and cook on Low for 8 hours OR on High for 4 hours, stirring occasionally. About 20 minutes before the slow cooker is done, whisk together cornstarch and heavy cream. Add this to the slow cooker while stirring. Cover slow cooker again and allow to finish cooking. You may want to begin cooking rice at this time. When dish is done cooking, remove bay leaves and garnish with cilantro. Serve over rice. Leave out the cayenne pepper to cut down on the spice. 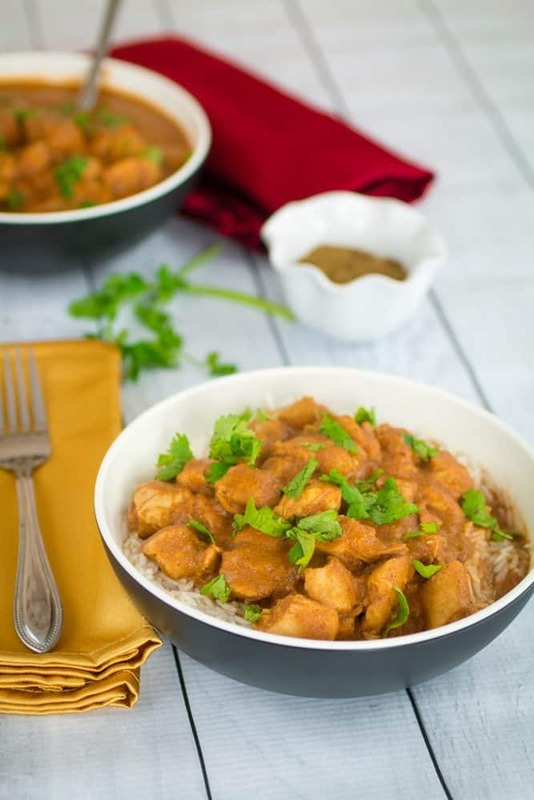 We love Indian food and everytime I see a recipe I want to try (like this one!) I say Oh I can’t wait to make this! And then I never do. I absolutely MUST change that. Love the use of the slow cooker, too. That makes it double appealing for me because I heart my slow cooker. 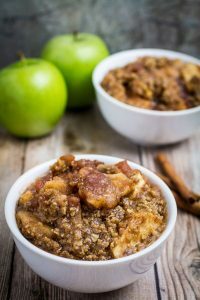 Definitely try this one, the slow cooker makes it so easy! My household loves Indian food, too! 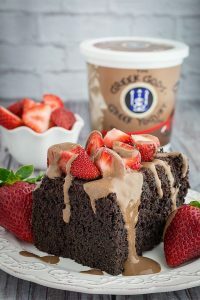 This looks delicious and is one of my family’s favourites. We love Chicken Tikka and we love slow cooked meals. Love the combination of spices that you have used. I will need to pull out the slow cooker and give it a try. Must make soon! 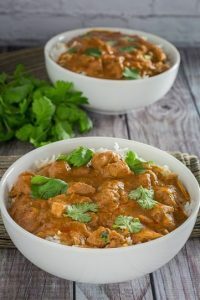 I love chicken tikka masala and slow cooker recipes are such a lifesaver – this is going to be a winner! Pinning now! Thanks for sharing! Sounds fantastic and so easy to make! 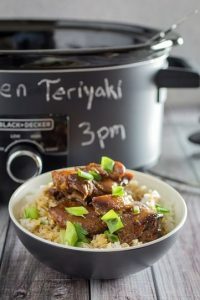 Love a good slow cooker meal! I’m already starting to dream about fall foods, this is perfect! Me too! only a month left until I can start making all of the savory comfort food that fall brings! So excited! This dish looks amazing!! I have never heard of doing this in a slow cooker .. what a great idea! I can’t wait to try this!! I think I would really love Indian food as well. I love spice but in Iowa it is few and far between! This looks really yummers. I am pinning! Thanks. Thanks for linking up at #HomeMattersParty! I recently was gifted a slow cooker, and I regularly cook BBQ chicken in it. This dish looks so good, I can see this becoming one of my favourites! Slow cooker?!?! Um, YES! We use our slow cooker all. the. time. and this would be an amazing addition to our list of SC dinners.